Full marks will be gained by complete solutions to all questions. Marks for each question are given. Answer the questions in the order given and start each question (not each part of a question) on a new page. Be clear and concise. Show all of your working. Answers to the Biostatistics assignment problems need to be written up in grammatically correct English. Failure to do so will result in deduction of marks. "I certify that the attached assignment is my own work and that any material drawn from other sources has been acknowledged". that you sign when you complete the coversheet. You may use a spreadsheet program such as Microsoft Excel to aid in your calculations. If you choose to use a spreadsheet program for any part of the assignment, then this must be clearly stated and a printout of the relevant session must be submitted with the written work. In the interests of fairness, extension of time for submission of the assignment questions will be given only in exceptional circumstances, and then only in accordance with University rules (see page 2). The deadline for Assignment 1 is 12:00 pm on Friday 8th of April 2016. You may hand in your completed work directly to Aiden Fisher in JO 19.346 (or in class) in hardcopy form or online students may email their assignments to a.fisher@ecu.edu.au. All late submissions are penalised in accordance to ECU guidelines. 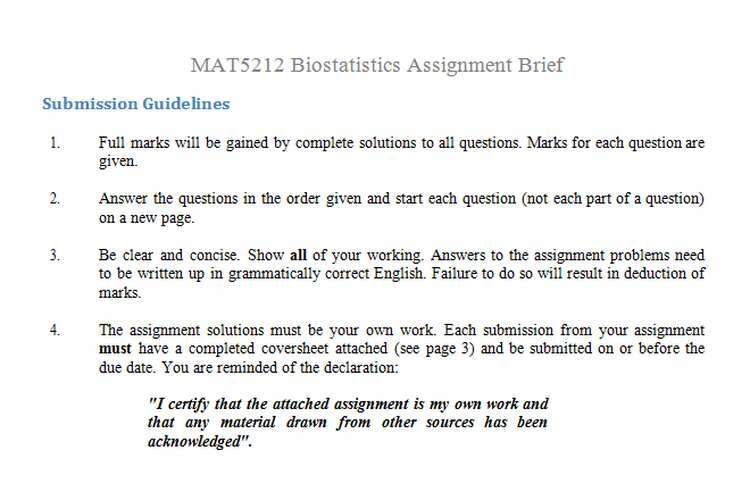 Assignment – Part 1 is marked out of 45 and contributes 15 % to your overall grade. Employment related intrastate, interstate and overseas travel – a letter from your employer, including your supervisors’ full contact details. Before generic drugs can go to market it needs to be shown that they are bioequivalent to the name- brand drug they intimidate. Suppose that below are the results from one such trial, showing the time in minutes between when the drug was administered in tablet form until the peak bioavailability of the active compound. Find the sample mean and standard deviation of the time until peak bioavailability for both the name-brand and generic drugs. Use the appropriate test to determine whether the generic drug has the same mean time until peak bioavailability as the name-brand drug, assuming that the times for both drugs are normally distributed and have equal variance. Find the 95% confidence interval for the mean difference in times assuming equal variance. Perform the calculations in parts (b) and (c) again this time assuming unequal variances with degrees of freedom ???? = 11.833 (round down to 11 if using tables). How does the conclusion of the test differ? Without doing any further tests which of the two results should be used? Give reasons for your answer. Find the sample mean and standard deviation of the percentage of particle retention for the smoking and non-smoking twins. What is the appropriate test for testing if there is a difference in the means of the two data sets? Explain your reasoning. Use the test you chose in (b) to determine if there is a difference between the mean percentage of particle retention for the smoking twins and the non-smoking twins, using a significance level of ???? = 0.05. How does the answer change if a stricter significance level of ???? = 0.01 is used for the test instead? From the following SPSS output what can be concluded about the distribution of the two data sets? Is this consistent with the assumptions of the test you chose in part (b)? Find the sample mean and standard deviation of the euphoria scores for each treatment. Use the appropriate test and determine whether there is a difference in the means of the euphoria scores for each successive treatment. What can be concluded from this test? Below is the output from SPSS of multiple post-hoc tests. Which outputs are appropriate for testing the assumption of the test used in part (b)? What are the conclusions of these tests? Daniel 8th edition] A study to test bone strength involved the collection of ten (10) cadaveric femurs from subjects in three (3) age groups: young (19-49 year of age), middle-aged (50-69 years), and elderly (70 years or older). Below is a table showing the force in Newtons required to fracture the bone. Find the sample mean and standard deviation of the force required to fracture the bone for each age group. Also find the overall mean and standard deviation for the force required to fracture a bone. Use the appropriate test and determine whether different mean forces are required to fracture the bones depending on the age group. If so, perform the LSD test to determine which of the age groups’ means differ significantly at a ???? = 0.05 level of significance. What are the assumptions associated with your chosen test in part (b) and what tests can be used to verify these assumptions?